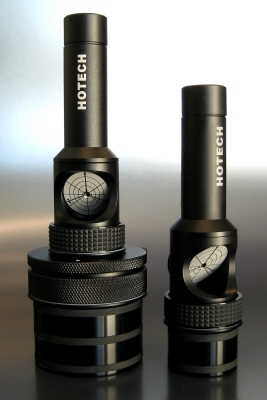 HOTECH LASER COLLIMATOR 1.25'' & 2"
"There is a tremendous amount of creativity and cleverness being displayed, all backed by a fervent devotion to making the sky more accessible and enjoyable for astronomy enthusiasts at all levels. No matter how tightly the tolerances machined on the laser collimator or the focuser, a small gap is required to allow installation of the laser collimator. 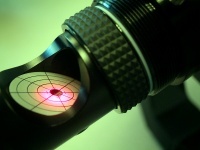 Once the laser collimator is inserted, the required gap becomes a problem. A laser collimator is secured with one or more thumbscrews or unified compression ring. Both methods introduce very critical issues, namely inconsistant adaption and off-axis installment that instantly destroys the precision of your collimation instrument along the entire optical axis. In summary, our SCA adapter serves three critical functions. First, its expansion rings accommodate almost all focuser's manufacturing tolerances. Second, it automatically centers the adapting laser. Third, it provides at least two evenly distributed circular contacts on the focuser's inner tube surface preventing the adapting laser from pivoting. Once the slop factor is taken away, you can quickly collimate your telescope in confidence to achieve perfect collimation every time. HoTech importance of this, so the faceplate is a standard feature in our laser collimatorunderstands the . All astronomers deserve to have it without paying any extra! In addition, our faceplate viewer�s pattern is laser engraved to ensure a long lasting sharp targeting grid for best visual effects. Unlike other collimators, the target is not a sticker that will peel, or paint that can rub or chip off. We understand that you are paying for a precision instrument that is supposed to be well made. 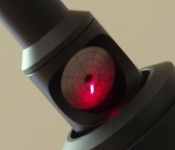 Keeping the laser dot to the finest point is the key to precision collimation. But when you look closely at the laser dot from brand to brand, most laser dots appear large, not really a fine point as you imagined. This means there is guess work involved when you try to center the dot; not just centering the laser dot to the center of the faceplate, but also centering the center of the dot itself. This does not make any sense when you are trying to take the advantage of the collimated laser beam's characteristic "which has a low beam divergence, so that the beam radius does not undergo significant changes within moderate propagation distances." In other words, the laser beam size within the collimation distance (laser collimator to the primary mirror and back to the faceplate) should remain a constant fine point. As you know, most laser collimator brands are not really laser manufacturers. They install an off-the-shelf laser module or pointer and align the laser in a tube without REALLY considering the user�s application, namely the operating distance for a laser beam size. 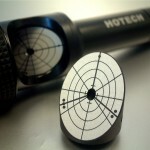 HoTech has been designing and building laser modules and systems for over 10 years for various professional industries. We know exactly how a laser should work. We limit our laser beam to the finest size in the correct operating distance for optimal effect. Our understanding and experiences with the laser design permit you to have an effective and precision collimation. Many laser collimator manufacturers give users the wrong impression, �big and heavy means rugged and stable.� Instead, HoTech engineers successfully cut the unnecessary weight on the laser collimator because we understand that additional weight on a telescope (especially open structure Newtonians) will create imbalance and structure sagging. In addition, the heavier the device is, the more inertia it will have during an impact from an accidental drop. In such an accident, the inertia force can cause more damage to the internal alignment mechanism because there is more energy required to dissipate from the impact. Therefore, the lightweight design on our laser collimator makes you gain reliable precision collimation. And of course our laser collimator uses aero-space grade lightweight aluminum material and CNC machined with the tightest tolerances, then sand blasted and anodized to protect from harsh environment. Nothing has been sacrificed while you get a long lasting state-of-the-art collimation instrument. There is an one-time-only preperation you need to do for SCT laser collimation. First, install the SCA laser collimator and premark the laser position on the target grid of the collimator when your telescope is collimated from the factory or from your star collimation. Then when you check for collimation next time, just adapt the SCA laser collimator on the focuser, 2" or 1.25" and see if the laser falls on the premarked laser position. If not, adjust the alignment screws on the secondary mirror to move the returning laser dot to the premarked postion on the target grid. See illustrations below. - Should we collimate with where the eyepiece is, which is not centered? - Video links of how to use the SCA Laser Collimator. 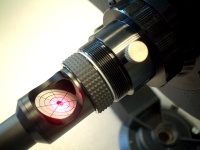 - Is Barlowed Laser Collimation Effective? - Diffraction Grating Pattern Technique with SCA Laser Collimator. - by Tierry Legault, a detailed paper about telescope collimation. - by Nils Olof Carlin, excellent article covering collimation facts with clear illustrations. 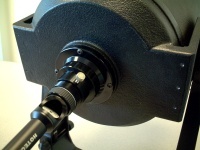 - by Nils Olof Carlin, Clear step-by-step instruction and an explanation of laser collimation. - Definition of the term collimator from Wikipedia.org, yourdictionary.com, and answers.com. The unit works for both 2" and 1.25" telescopes. It comes with a 1.25" SCA laser collimator pre-loaded in a 2" to 1.25" SCA adapter.